I am so very delighted, so honored, and . . . may I say . 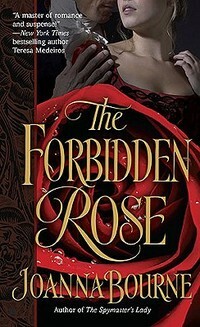 . . surprised and knocked off my feet and spit-drying-in-my-mouth excited, that Forbidden Rose won one of AAR's categories. Forbidden Rose, winning 'Best Romance not set in the UK'. Thank you very, very much. I am honored beyond words that folks nominated Forbidden Rose. This book was hard for me to write. I'd already pictured my hero and heroine as a happily married couple. I had to delve back into the past and imagine them much younger. See them at the moment they met. There was this also - their love story was set in a grim era of history. I wasn't sure anyone would want to join me in an adventure there. Thank you so much for followin my Doyle and Maggie back into their dark and dangerous past. I am so delighted you liked the book. I take this and I hug it close. Because this is isn't just one reviewer saying she liked it. This is READERS saying they liked it. Since Readers were cool enough to say they liked the book, let me list the other cool books that won accolades. There is just nobody on this list that isn't worth tracking down and reading if you haven't already. We haz links. Click on the author name to find out more about the book and buy it. Congratulations, Jo, for the win and the honorable mentions!!! Wow. Those are all great books, but I have to admit I voted to TFR as best romance, Doyle as best hero, D-M as best couple, ...in adition to the categories you did win. So I can't exactly say I agree with the results! Congratulations! I'm so glad you took a few of those categories; your books make me swoon. Swoon, I say! AAR is an old site. One of the originals. Very large. Very savvy. Highly respected. Their reader surveys mean a lot in the Romance community. I am so very happy about this. Well-deserved, and congratulations! Congrats, Joanna. I also voted for TFR as best romance and Doyle as best hero. But I will definitely pick up the others on the list. Also, though it didn't win, my vote for short story in an anthology went to Diana Gabaldon's A Leaf on the Wind of All Hallows. Amazing as a stand alone or for anyone waiting for the next Jamie and Claire adventure! Do you know . . . I have not yet read LEAF. I will have to get to that as soon as I can scrape together some time. Congrats Jo! You deserve this accomplishment and more! Here's to more good wins in the future. Congratulations! I so glad that TFR won the Best Historical Romance not set in the UK category and is a close second in the Best Romance category since that's how I voted. AAR is such a good site. I really feel as though it belongs to the readers. Congrats! This is great news! !